The Virgin of Manaoag has an amiable, radiant expression. Her countenance inspires love, adoration and awe. She exudes beauty beyond description. She is patroness of the sick, protectress of the helpless, benefactress of the needy. Her miracles are numerous and are not only part of the past but continue to adorn the present. Hence so strong is the devotion her devotees have for her that wherever they may find themselves they do not fail to visit her to ask that Masses be said for them at her shrine or that candles be lighted on their behalf before her. Some send flowers to decorate her throne and others even prepare a cloak for her wear. Her devotees come to her shrine throughout the year. But it is in April and May that they come in big numbers making Manaoag a truly pilgrimage site. People from all walks of life and almost all parts of the country flock to her either to thank her for favors received through her intercession or to petition her once more for more favors or graces or simply to honor her. Along the walls of her shrine the more famous miracles attributed to her are depicted in giant wall paintings. One reveals the story of a sick child from Binmaley who died on the way to the Lady's shrine. His dead body was nevertheless brought to the shrine before the feet of Our Lady and there it was brought back to life to the joy of his parents. One other well known miracle is what happened to a man from Dagupan whose throat was infected from a fishbone he swallowed. He was cured when water that was used to wash her hands was poured into the dying man's lips. Aside from curative intercessions, the Lady is even known for protecting crops. It is said that she saved Pangasinan and other northern provinces from the locust of 1698. Folks have retold of the days during which they tried to protect the rice fields from swarms of locusts that come darkening the sky. They finally sought for the Lady's help. A procession was made to the fields. When they laid her image down in the midst of the devastation, the locusts began to exterminate each other in an incomprehensible way. This ferocity went on for five days until not a single locust could be found. The Lady's rain miracles which are known to happen even at present first transpired in the drought of 1706. The stories during that year's dry season describe dried and wellowed seedlings parched under a cloudless sky. For days that stretched to months, the people of Manaoag hopefully waited for rain. But it did not come. They called on their last recourse, the Lady of Manaoag. She demonstrated her great compassion once again. During the first day of the novena and procession, right after she was brought hack to the church, from the outskirt of the town, clouds gathered about the sky and dimmed the stars. A downpour soon fell and continued for days. Her origin as Patroness of Manaoag is surrounded with a myth as mystifying as the lovely expression of her face. Tradition has it that the town itself was born from the Virgin’s call, thus the term, "taoag" meaning "to call" was used to name the town. It is said that one day, a young man "walking home heard a Lady's mysterious voice. He looked around and with great awe saw the radiant Lady with a Rosary on her right hand and a Child on her left. standing on a cloud veiling a treetop. The man fell on his knees. He told the people of the apparition. And soon right on the spot where the Lady appeared a church was built. A town quickly flourished around it and was called "Manaoag". 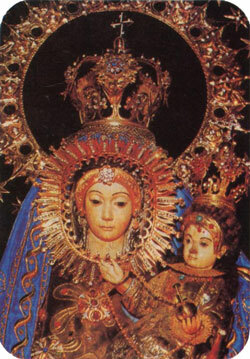 The Virgin has assured the people of Manaoag of her protection on several occasions. During the early times when mountain tribes used to burn Christian villages, Manaoag was not spared. It was set on fire. The church with its thatched roof was the last refuge of the people. But the leader of the pillagers, climbed over the fence and shot lighted arrows to all parts of the church. Not a single flame, however, set it on fire. This miraculous event was repeated during the World War II. In spite of several bombs that found their way into the church, not one of them exploded thus keeping the shrine intact. People are fond of relating one incident that happened in 1697. It was Easter Sunday when a fire of unknown origin razed the town and reached the church. The Father Vicar went inside and snatched the Lady from the sacristy. Addressing her, he made this remark: Blessed Lady, if you do not spare the church from fire, I will hurl myself into the flames with you so that the two of us may be consumed with it. The flames in the sacristy suddenly died out. But when the Vicar tried to put the Lady's image back to its place, he could not budge it. It took then four men to carry her back to her throne. Several plans to make a new site for her church never materialized. Somehow, in many varying ways, the Lady has expressed her refusal. The most remarkable story was that of the church which was built near the banks of the Baloquing river. According to the story, when the morning of the transfer came, some parishioners who were sent by the Vicar to make the place ready were stupefied with what they saw: nothing. Nothing was left of the structure except four pillars starkly standing amidst clear ground. No trace of the other parts. The parishioners reported what they saw and the Vicar decided to go there himself. Humbled by the truth of what the people told him, the Vicar knelt, asked forgiveness and vowed never to attempt to transfer the site of her shrine again. On the hilltop where the Lady of Manaoag's shrine stands up to this day, thousands continue to flock every year. Huge crowds attended the day the image was canonically crowned by the Papal Nuncio in April 21, 1926. So also during the silver jubilee celebrations in 1951. This year, 1976, Manaoag is preparing itself to receive the flocks of devotees who will come to honor her on her golden jubilee of the year. By the time that comes she shall have visited all the barrios of Manaoag, and all the towns of Pangasinan – something she does every twenty five years. From the Solemn Novena in honor of Our Lady of Manaoag published by the Shrine of Our Lady of Manaoag, Manaoag, Pangasinan, Philippines.